It’s been a while since we've covered a Kinect hack here at GeekTech, but the Kinect BeatWheel is too awesome to miss. Developed by Ryan Challinor for a Music Hackday in Boston, BeatWheel aims to please the music-producing geek and DJ in you. 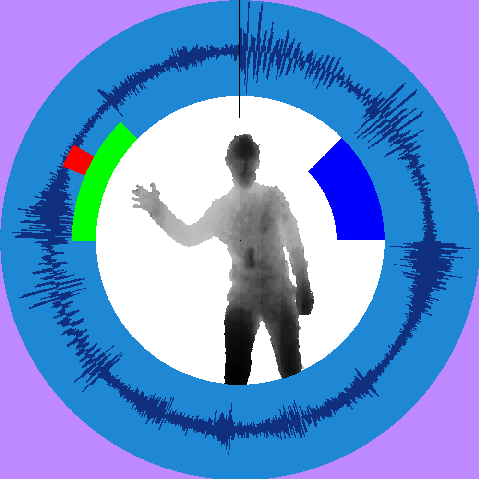 The hack controls which looping-sample beat is playing and how with a movement of your arm. It works by cutting up a sample into eight note slices (although you can make the loop segments longer if desired) and displayed into a circle placed around your body. You control the playing segment (indicated by a green marker) by moving your left hand (shown by a red marker)--rotating it in a clockwise fashion keeps the track playing over. A blue indicator signifies the tempo, which you can adjust to your liking. However, if you deviate from the clockwise movement, you can create some cool remixes. Rotate your arm anti-clockwise, and the track plays backwards. Keep your hand still and the beat repeats the area your hand is resting over (it's kind of like scratching). The hack supports multiple loops and the vocal tracks also sound clear, so your imagination can run wild you mix. The hack was created using Synapse for Kinect (also developed by Ryan) and MaxMSP, which are both designed specifically for creating and controlling musical and interactive projects. Check out the video below for a few samples of remixes created with BeatWheel, and try not to imagine yourself as the greatest DJ (in your home at least) going.